Tír na Hilán Self Catering Cottages and camper field are located 4 km from historic Castletownbere, Ireland's largest white fish port. The farm is on the Beara Way Walking and Cycling Trail in County Cork, on the Beara Peninsula. Tír na Hilán is an open organic farm on a hillside 200 m above sea level, with sheep and seven riding ponies who can take you on a trekking on the hills and nearby forest. Stabling is available if you would like to bring your own horse. 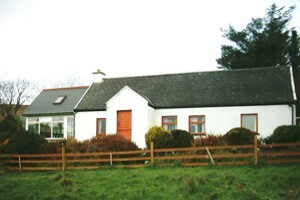 The two modern cottages, each sleeping five or six, are on a hill road in a secluded location. They have pine and tiled floors, the heating is by open fire, while each bedroom also has an electric heater and the living room a storage heater. You will get a supply of turf from the bog. The kitchen is equipped with electric cooker, small fridge, microwave, toaster and kettle. A washing machine, tumble drier and small freezer are in an adjacent shed. The bathroom has a bath with shower attachment and wash hand basin. There is a separate toilet. Furthermore, each cottage has a sunroom attached. On lovely dry and high ground you can pitch your tent and enjoy the beautiful views. Roam the hills, cycle the boreens or discover historical and archaeological sites. You can visit the meditation centre of the Buddhist monks or enjoy fabulous seafood, golfing, canoeing or sailing. There are three prehistoric sites nearby, including a stone circle, ring fort and a megalithic tomb. The nearby wildlife habitats along the coast provide spectacular bird-watching and seal colonies. The market town of Castletownbere hosts numerous restaurants, cafes and pubs, where fish is of course one of the many dishes on offer. There are a lot of art galleries and craft shops and in August The Beara Arts Festival takes place.